Explosively drive the ball, keeping the back elbow up so the shoulder doesn’t get injured, into the wall. 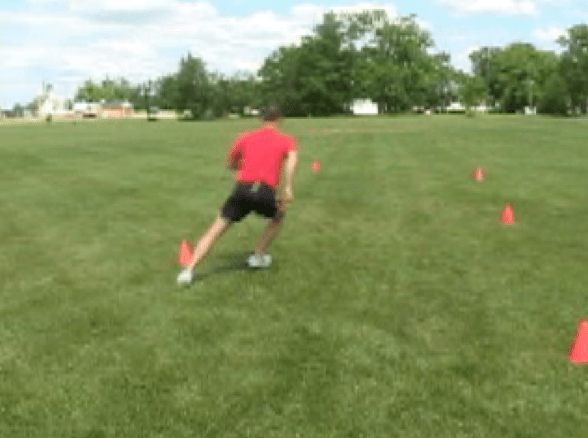 The focus of the exercise isn’t so much on throwing, it is on understanding being in the best stance to drive the off the back leg like a lateral shuffle. If the athlete is too narrow in stance or standing too tall the power production will be limited. The athlete will shuffle one to two times staying in a good stance and then driving off the back foot and transferring the speed into the throw. The athlete must use the back foot to push down and away to generate more speed on the throw. If the athlete does not have a good athletic stance (foundation) they will not generate enough force to gain benefits. C. Backward shuffle side throw– Same exercise but now the athlete will shuffle away from the wall. Start the athlete only 6-8 feet from the wall. 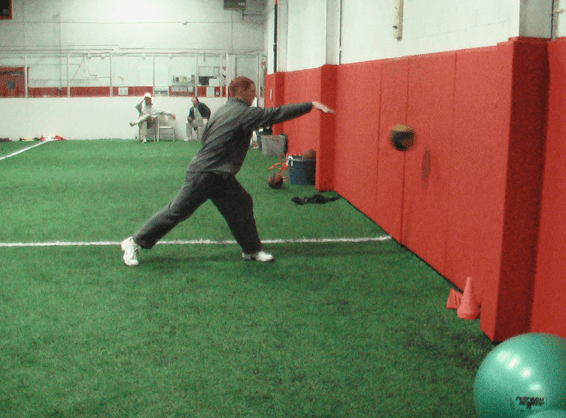 The athlete will shuffle aggressively one to two times away from the wall and plant aggressively to throw the ball. This is the most important exercise of all to reinforce the athletic stance and the importance of plant leg angles. If the plant leg of the back leg is too narrow when attempting to stop the throw will be weak. 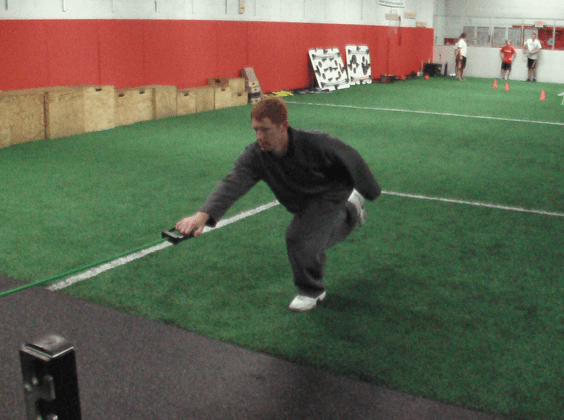 The athlete wants to still get forward movement when throwing. I like to do 2-4 sets of 3-5 reps on each side. The exercise has to be intense. The wt of the ball, experience of the athlete, and skill level determines the sets and reps. 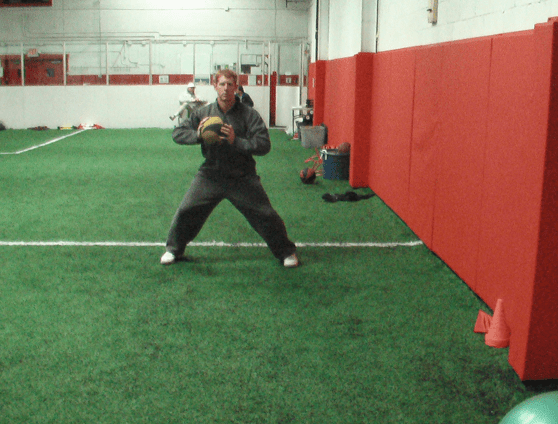 This is the stationary version of the Side Medicine Ball Throw. The forward shuffle throw and backward shuffle throw would still get the athlete back to this position. The backward throw crucial for teaching deceleration angles. If the plant is poorly done the throw will show it. Great feedback drill. 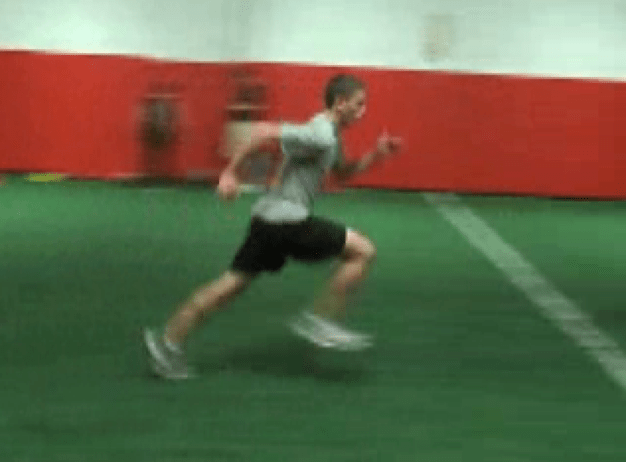 This is a great speed exercise because it focuses on both deceleration (which is what most quick athlete do better than other athletes in athletic speed) and acceleration. a. The initial position is having the athlete squat/bend on one leg and resist the pulling action of the tubing. The decelerators are kicked on. b. Then the athlete quickly stands and pulls on the tubing while driving the knee up. This recruits the accelerators. c. The extra benefits of the this exercise is the balance and stability ttraining. We normally do 2-4 sets of 5-8 reps per side. Slow down into the squat/bend and explosive up. In this shot the athlete is ready to react and shuffle or crossover in the direction the coach points. This is a real live setting for athletes to develop their skill and for coaches to use great feedback. a. The athlete will get into a loaded athletic stance and be prepared to shuffle or crossover (already determined by the coach) and react to the coaches point. b. This type of exercise is great for athletic speed development because the athlete must randomly react. The athlete will use his or her innate abilities. If a mistake is made the coach can easily correct and have the athlete reproduce a better pattern for many reps. I normally will do 2-3 sets of 3-5 reps. The athlete will react out to the cone and get back as quick as possible for one rep. Because I am after speed I will allow decent rest so the athlete isn’t completely pooped out. I like resisted power skips for speed because it increases force production and extension of the hips. a. 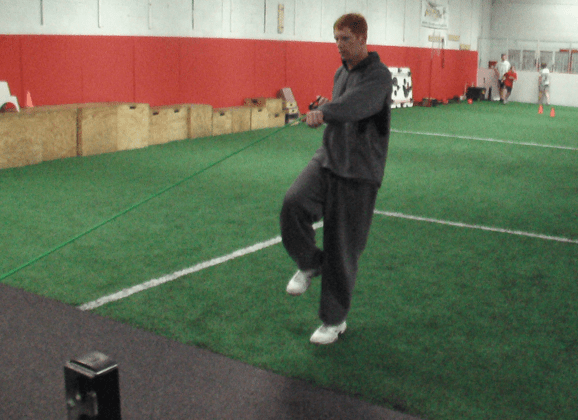 The athlete must learn to drive hard to move the resistance of the tubing yet maintain good posture for acceleration. b. The athlete will learn to coordinate the arms and the legs during this exercise. It isn’t easy at first. c. The biggest benefit is that more muscle fiber gets recruited when attempting to power skip. This is the goal to generate more acceleration speed. I like to perform 3-6 reps for 20 meters. This is enough distance to get enough quality push offs yet not too far to get overly fatigued and change mechanics. To increase the mechanics and efficiency of accelerating from various starts you must practice them. a. I will use falling starts, get ups, box starts, parallel stance starts, and many other variations so I can coach the athlete on the proper technique. b. The goal is to be consistent with leg and arm action as well as acceleration posture. c. If the athlete has breaks in his or her form they can be addressed quickly. I like doing 2-3 different stances and 3-4 reps of each. Plenty of time is available to teach the form well. 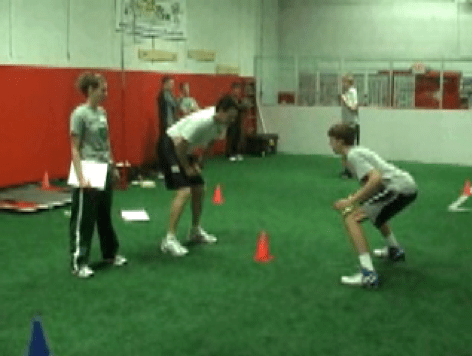 Teaching cutting is a great way to improve the efficiency of the athlete in athletic speed. Most court and field sport requires so much in regards to change of direction it is important to address it. b. The athlete must learn to make the cut by re-directing the cutting foot outside the width of the body that meets the angle they cut will be made at. I do not want the athlete to purposely drop low with the hips if the cut must be quick and not real sharp. c. If the cut is sharp and the athlete must come back then the hips may lower slightly but only enough to control the center of mass. This entry was posted in Fitness and Performance, Speed Training, Sports Performance Training, Strength and Conditioning, Youth Athletic Training, Youth Performance Training and tagged Athletic Performance, K2, Kevn Haag, NJ, Performance.